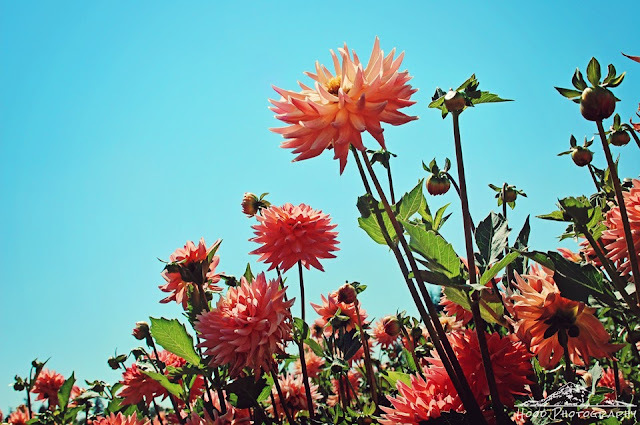 Here is another photo from my visit to the Swan Island Dahlia Farms. These beauties were reaching sun ward, their petals glowing in the light. This is gorgeous!! Love the color as well! Lovely dahlias! Have a great weekend! Stunning shot! I love Dahlias! Lovely shot with wonderful framing! I love your combination of colors here. It is hard for me to get good color looking up at the sky. Que flores diferentes! São lindas! Amei o ângulo da foto!